Sales & Supply of: ABS Oenology fittings and Food Grade Spigots, Valves and Taper Threaded Cones and Hose Fittings. These fittings are ideal for wine making and other alimentary applications and are available in 3/8', 1/2' and 3/4" BSP threads. These Spigots, adapters and nut fittings offer a highly versatile and cheaper alternative to stainless steel fittings, and can be fitted to both wooden barrels and tanks, depending on their thread size. TOP: These Female ABS Food grade Taper Threaded Fittings can take BSP 3/8", 1/2" and 3/4" standard male taps to facilitate the spigot's fitting into a wooden barrel. The female, tapered cones are available in 7 different sizes - four for 3/4" taps, Two for 1/2" taps and One for 3/8" taps, all BSP standard. 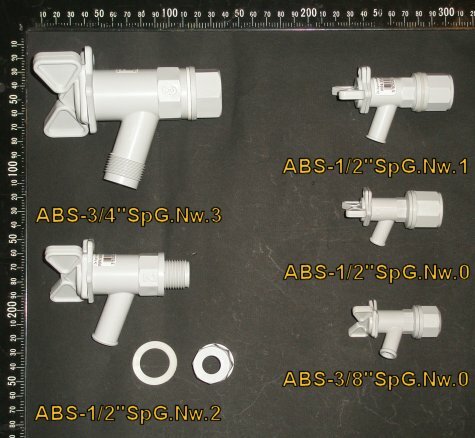 LEFT: ABS SpB Fittings - Food grade Valves, Spigots and Taper Cones - Can be supplied with or without Taper Cones (for wooden barrel fitting). ABS-3/4"SpB.C.3 (26mm outer diameter of the threaded part); Can be fitted with a pipe hose and fits matching ABS 3/4" Taper Cones. ABS-3/4"SpB.Nw.3 (26mm outer diameter of the threaded part; Can be fitted with pipe hose and supplied with nut and washer for tank use. ABS-1/2"SpB.C.2 (21mm outer diameter of the threaded part); Fits matching ABS 1/2" Taper Cones. ABS-1/2"SpB.C.1 (21mm outer diameter of the threaded part); Fits matching ABS 1/2" Taper Cones. ABS-3/8"SpB.C.0 (16mm outer diameter of the threaded part); Fits a matching ABS 3/8" Taper Cone. LEFT: ABS SpG Fittings - Food grade Valves, Spigots complete with matching Nuts and Washers for tank fitting. ABS-3/4"SpG.Nw.3 (26mm outer diameter of the threaded part); Supplied with matching nut and washer. Hose can be fitted. ABS-1/2"SpG.Nw.2 (21mm outer diameter of the threaded part); Supplied with matching nut and washer. ABS-1/2"SpG.Nw.1 (21mm outer diameter of the threaded part); Supplied with matching nut and washer. ABS-3/8"SpG.Nw.0 (16mm outer diameter of the threaded part); Supplied with matching nut and washer. 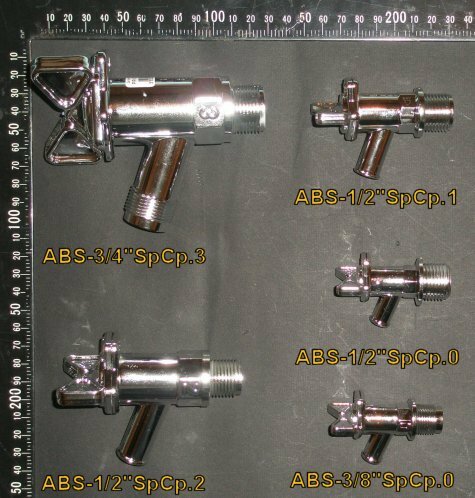 LEFT: ABS SpCp Fittings - Food grade Valves, Spigots with Chrome Plating finish, complete with matching Nuts and Washers thus ideal for tank fitting. ABS-3/4"SpCp.3 (26mm outer diameter of the threaded part); Hose can be fitted. ABS-1/2"SpCp.2 (21mm outer diameter of the threaded part). ABS-1/2"SpCp.1 (21mm outer diameter of the threaded part). ABS-1/2"SpCp.0 (21mm outer diameter of the threaded part). ABOVE: Food grade ABS Taper Cone / Adapters available in 7 different sizes and are designed to facilitate the installation of male threaded taps to wooden barrels. ABOVE and LEFT: All our Male, BSP Threaded Brass, Nickel Plated and Stainless Steel Taps, Spigots, Spouts an Faucets can be fitted with one of our BSP 3/8", 1/2" and 3/4" inches ABS Plastic Taper Threaded Cones or the costlier Stainless Steel Taper Threaded Cones, thus enabling these and any BSP tap to easily fit a Wooden Barrel. Also we can supply BSP 3/8", 1/2", 3/4" and 1 inch Female/Female Fittings thus converting any matching BSP Male Threaded Tap into a Female one and enabling it to fit a matching Male Threaded Pipe. All these fittings are food grade and can be used in wine, spirits, liquor and vinegar making and other alimentary applications. ABOVE: Any 1/2'' BSP tap such as the TSS01.02, TSS04.02 and others can fit into the half inch F/M01.02 Adapter. These Adapters fits into a 21.5 mm hole and for the length of 55mm they can be fitted through wooden barrels, tanks and are often used in customized dispensing projects. Sample , Trade and Non Trade Orders: Our ABS Valves, Spigots and Taper threaded Fittings are usually in stock and can be purchased in single, small or larger quantities.